Antioxidant-rich foods, such as colorful fruits and veggies, are considered super-food because they help strengthen the immune system, staving off a cold, the flu or infections, and some people even believe they play a big part in warding off chronic diseases (such as cancer, arthritis and more) because they contain high sources of vitamins, minerals and nutrients that protect and repair cells from free radical damage. These foods can really make a big impact inside your body. What about fighting free radical damage on the outside of your body? Free radical damage shows up on our skin as sun damage (hyperpigmentation), fine lines and wrinkles and skin cancer. Are you thinking that if only there was a way to apply antioxidants to the skin to lessen and/or prevent free radical damage . . . Well, there is a way to do that! Santa Barbara cosmetic surgeon, and founder of Evolutions, Dr. Terry Perkins, recommends Revale skin care products as the “top of the line” antioxidants-for-your-skin products on the market today. 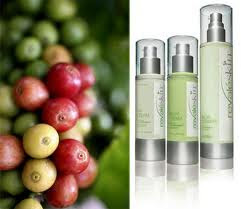 Revale products are formulated with CoffeeBerry® extract derived from the coffee plant (Coffea arabica) and has one of the highest antioxidant scores ever recorded. Topical application of this “active” antioxidant will help repair prior environmental damage as well as decrease future damage. RevaleSkin Facial Cleanser: Purifies and clarifies. RevaleSkin Day Cream with SPF 15: Smooths and softens. We can all benefit from a good dose of antioxidants daily on the inside and the outside!